Skype launches an Open Beta phase for its Skype for SIP service. Over 10,000 businesses worldwide have lined up to join the program. Over the past eight months, Skype has been running a closed Skype for SIP beta program. A couple of PBX vendor agreements have been signed while Skype personnel have been having discussions with potential Skype for Business customers about their use of business communications processes. Yetersday Skype has announced the launch of the Skype for SIP Open Beta program. According to Skype’s press release nearly ten thousand businesses around the world have applied to participate in this open beta phase. However, this phase is also open to any new applicants, whether PBX manufacturers, SIP gateway vendors or individual enterprises, who want to learn how they can take advantage of Skype for SIP in their business communications. allows a business to provide inbound calling from a Skype client (whether on a PC or embedded in devices such as the RTX 3088 Dualphone), web-based click-to-call buttons or a Skype Online number through a SIP-enabled PBX or Unified Communications system. A company’s IT administrator just creates and registers a Skype Business Control Panel (BCP) for the organization and then follows the instructions to configure Skype for SIP to work with its existing SIP-enabled communications system. This Web-based tool allows a company to control its Skype usage from a single point and enables centralized billing, easy allocation of Skype Credit, subscriptions and online numbers to users, as well as reporting about both usage and spending. Furthermore, it gives companies the ability to manage internal employee accounts, including who uses Skype and who doesn’t and what features they can use. As an example of the cost savings, Enterprise Business Development Manager Matthew Jordan described a company who would replace a T1 line with 23 lines at a cost of, say, $400 per month plus per minute toll charges, at up to,say, $0.03/minute, for both inbound and outbound calls. With Skype for SIP, the company would be looking at a cost of $161 per month for the 23 voice channels plus low SkypeOut rates for outbound calls to landlines and mobile phones anywhere worldwide and no charges for inbound calls. From Skype’s perspective, a primary goal of this beta phase is to monitor usage to determine experience-based usage patterns. To facilitate this goal, during this open beta Skype for SIP will have a 20% burstage allowances such that a company with 10 channels can actually use up to 12 channels as a means to optimize bursting levels required based on real calling patterns. With over 10,000 Skype for SIP customers, they hope to gain statistically significant data as well as learn more about scalability and robustness issues. The entire systems is designed to be global and scalable as numbers build. The required SIP gateways (at sip.skype.com) will be independent of SIP gateways used for legacy consumer SkypeOut calling. Skype for SIP is a classic case of a transitional offering. Enterprises continue to use their legacy SIP-enabled PBX and then add Skype for SIP such that they can continue making calls but run them over Skype for SIP to reduce costs as they feel more and more comfortable with the advantages of the Skype for SIP exerience. It provides a low cost means of adding voice channels; it also allows a company to expand their calling into new countries at low SkypeOut rates with the only provisioning being the initial setup of Skype for SIP via the business control panel. 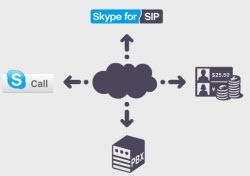 More information, including an introductory video, can be obtained and Business Control Panel accounts set up at the Skype for SIP beta website at sip.skype.com. Peter Parkes: Skype for Business Blog: Skype for SIP beta program opens up to all businesses. All Voice On The Web posts mentioning Skype for SIP.